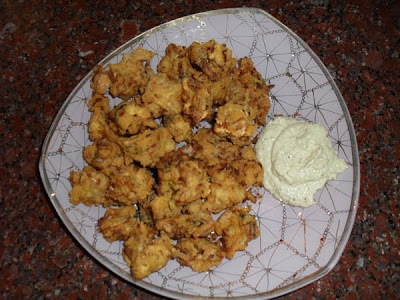 My mother - in - law was an expert in preparing delicious Pakodas. She used to prepare them by the time my father - in - law and his friends settled down in their garden chairs after their evening walk in the golf course. I ran up and down serving them the hot delicious snacks as and when my mother - in - law drained them out on the serving plates. Hot coffee and crunchy yummy pakodas are an ideal combination to while away time on a lazy rainy day. Green chillies - 2 ( finely minced) or 4 if you need it more spicy. 1. 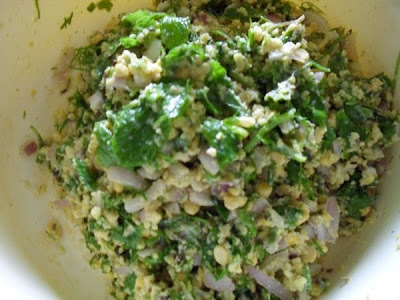 Mix finely chopped onion, chopped green chillies, chopped curry leaves, salt, chilly powder, cashew nuts and cumin seeds in a bowl. 2. Mix in the besan and rice flour to the mixture and knead lightly until the flours become moist with the juice of onion and salt. 3. Heat oil in a kadai and decrease flame. 4. Take out 3 tbsps of hot oil from the kadai and pour over the flour mixture and mix thoroughly. 5. Mix few drops of water little by little until the flour binds all the ingredients loosely together. 6. Increase the flame. 7. Pinch a marble size of dough and drop it in hot oil without shaping it. Pinch and drop some more pakodas in hot oil and cook them in batches. 8. Flip the fritters using a perforated ladle, and cook till all the pakodas become golden brown in colour. 9. Remove the pakodas and drain them on a paper towel. 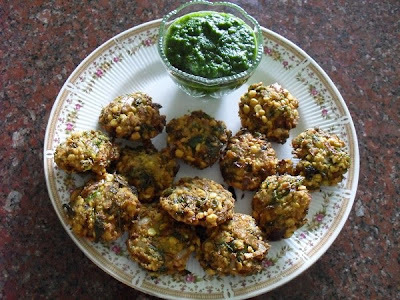 Serve the crisp hot and spicy Mundiri Vengaya Pakodas with coconut chutney or tomato sauce. Three decades ago when my children were of school going age they eagerly looked forward to their father's return from the golf club. He always brought back a hot parcel of yummy snacks (bondas, bajjis, masala nuts, finger chips and many more) from the club after his game, which the children relished. The mini masal vadaes the size of a one rupee coin were my children's favourite. They greedily gobbled them up with coconut chutney or mint chutney which accompanied the vadaes in the parcel and a lot of tomato sauce from the refrigerator. 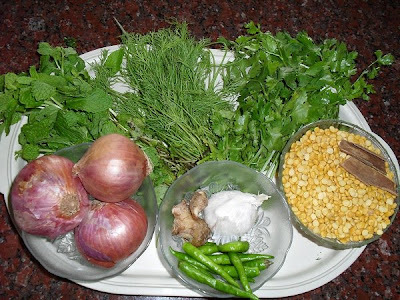 I had never tried preparing masal vadaes at home for a very long time , until Lakshmi arrived. She helped us in all our house hold chores and she prepared yummy 'Golf Club' masal vadaes as long as she stayed with us. 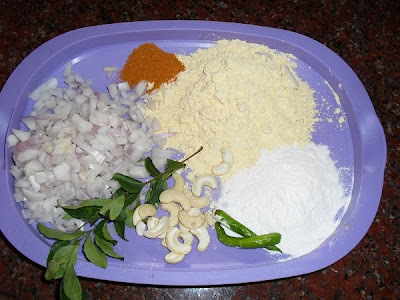 Now a days Masal Vadaes have become a part of our party cooking. It is an addictive snack for a cloudy day. METHOD1. Soak bengal gram dal for one hour. 2. Chop onion and herbs and keep aside. 3. Grind 2 table spoons of the soaked dal with ginger, garlic, green chillies and cinnamon into a smooth paste. 4. Drain the remaining dal and add it to the paste and run the mixer for a minute to get a thick and coarse batter without adding water. 5. Mix the batter evenly with a spatula and run the mixer for a few more seconds if necessary. It is fine if some dal is still left uncrushed. 7. Heat oil in a kadai. 8. Make a small ball out of the batter and flatten it on your palm into a vadae, and slide it into the hot oil. 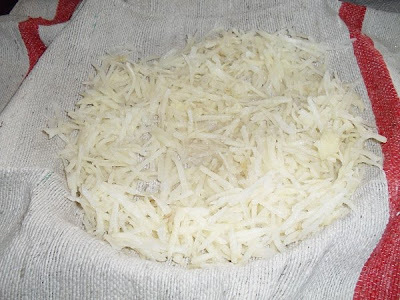 Vadaes can be cooked in batches of six or eight depending on the size of the kadai. 9. Do not disturb until you see a colour change around the vadaes. Gently flip the vadaes and cook on the other side. 10. Cook until the vadaes become a golden reddish brown in colour on all sides. 11. Take them out using a perforated ladel and drain them on a paper towel. Pop the crunchy munchy piping hot Masal Vadaes into your mouth as they are or after dipping them in mint or coconut chutney. Find yourself on cloud 9 on a gloomy cloudy day ! 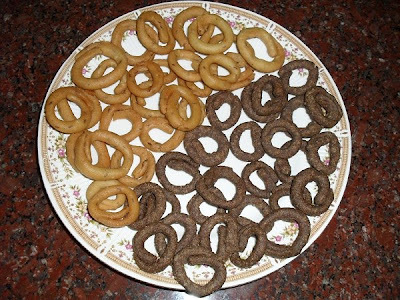 My mother -in-law loved to prepare savoury snacks, and Kolavadai ( known as Kodubale in Kannada ) was one of her specialties. 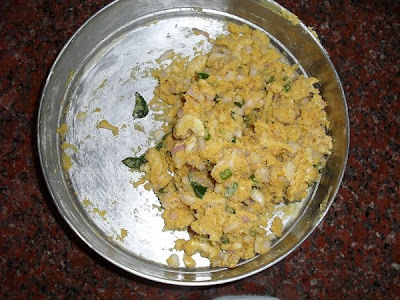 The Kolavadai/Kodubale she prepared using a few ingredients could never be stored, as all of us polished them off even before she could finish frying the entire lot! It is a joy to munch Kolavadai/kodubale in between sips of hot coffee or tea especially on rainy days. 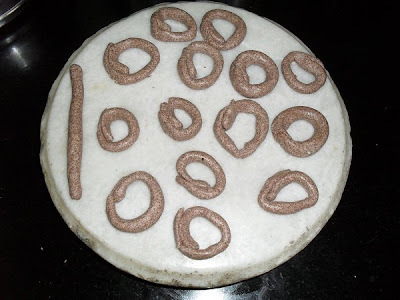 Kolavadai/Kodubale can be prepared using rice flour or ragi (finger millet) flour. Both can be prepared by following the same recipe. Method 1. 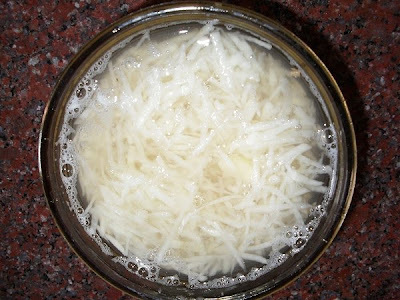 Grind coconut gratings,green chillies, salt and asafoetida to a smooth paste adding water if required. 2. 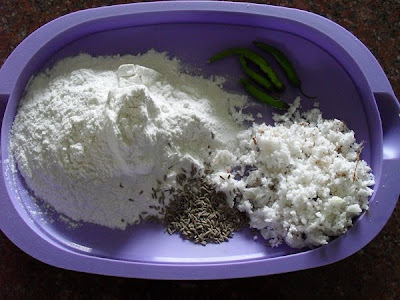 Take the flour of your choice in a bowl and mix in the ground paste and cumin seeds, and rub in the ghee or butter. 3. Now add water little at a time and knead to form a smooth, pliable but stiff dough. 5. Bend one end of the 'rod' and join it to the other end, overlapping the ends slightly, making a 'kolam' (circle) or ' bale' ( Bangle). The kolavadais can be prepared in any convenient size- finger ring, bangle or medium size. 6. Heat oil in a kadai on low fire and wait till the oil starts giving out an aroma. This indicates that the oil is hot enough. You can test it by dropping a pinch of dough in the oil . 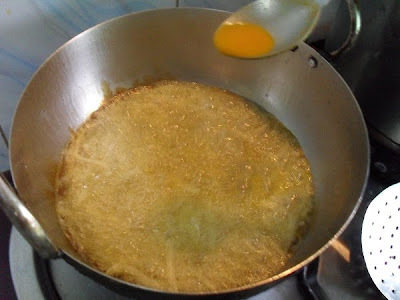 If it rises immediately, the oil is ready for frying. 7. Slide 6 Kolavadais/ Kodubales ( or more if the kadai is big enough) into the hot oil and do not disturb for a while.When the frothing and hissing decrease, and when the kolavadais/kodubales are stable enough, turn them with the perforated ladle. 8. Cook till the kolavadais/Kodubales start floating and the bubbles subside. 9. Remove when the rice kolavadais/kodubales acquire a golden hue and drain on a paper towel. 10. Roll and keep the second batch ready while the first batch is cooking and start frying as soon as the previous batch is taken out of the oil. Allow the Kolavadais/Kodubales to cool and then store in an air tight container which will be surely emptied in no time! Mother ruled out cooking beet root in her kitchen because of its colour. 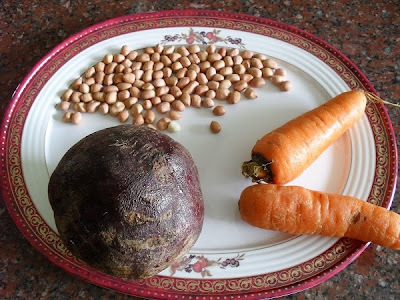 As her grand children grew up and they took a liking to the vegetable she slightly relaxed her rules and agreed to prepare only porial or curry using beet root. 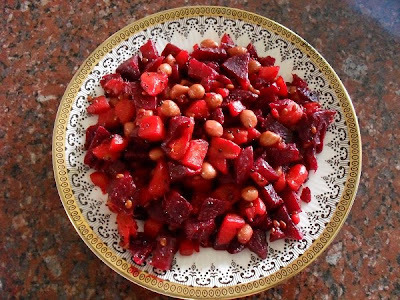 Henceforth beet root curry or porial became an oft prepared dish at home. But she still shuns it in koottu or pachadi. My grand children like beet root porial when I add a handful of pea nuts to it. Here I have also added carrots to enhance the colour of the porial and the children enjoyed it more than ever. 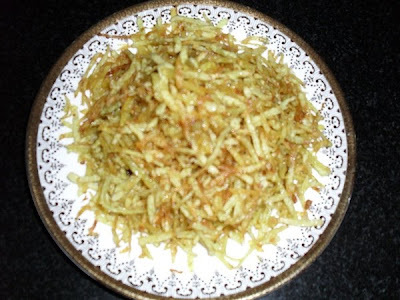 It is a very simple but healthy and nutritious dish which can be savoured as a side dish. 1. Wash and pressure cook whole beet roots and carrots without adding water to the vegetables. The steam in the cooker is enough to cook the vegetables. 2. 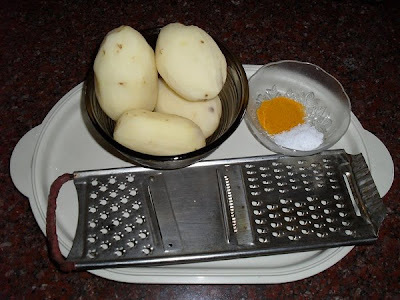 Cool the vegetables thoroughly and then peel as you would peel potatoes. 3. Chop them into small cubes and keep aside. 5. When the mustard seeds splutter add black gram dal and roast till golden in colour. 6. Add pea nuts and roast till they crackle. 7. Add chopped vegetables and salt, and keep stirring till the curry/porial becomes dry. The sweet taste and the attractive colour of the vegetables, and the aroma of the seasoning is sure to attract one and all to the dining table.